Leigh Anne Wenning, left, and Laura Zureich pose for a photo at the Champaign County Board of Developmental Disabilities. The boards of Developmental Disabilities in Shelby and Champaign counties have named a successor to Superintendent Laura Zureich, who plans to retire at the end of 2018 after nearly 14 years. Leigh Anne Wenning will join the county boards on Oct. 1, spending the last months of the year training with Zureich and learning more about the agencies and communities, though she is no stranger to the field. Wenning spent 14 years at the Miami County Board of Developmental Disabilities, most recently as the human resources director. She began her career in the DD field as a direct support professional, providing in-home care to people with developmental disabilities through service provider agency Toward Independence. From there, she built her career as a service coordinator in Franklin County and a mental health case manager in South Carolina, before joining the Miami County Board of DD in 2004. Wenning holds a bachelor’s degree in psychology from Wright State University and will complete her master’s degree in administration in August through Central Michigan University. She lives in Anna with husband, Patrick, and their two children. According to Zureich, Wenning makes the transition to retirement a bit easier. When asked about the most significant contributions of Zureich’s tenure, Shelby County Board of DD President Nate Counts says it’s a long list. Counts and his counterpart, Jeanne Bowman, board president for the Champaign County Board of DD, pointed to other accomplishments under Zureich. Most notably, Zureich helped both counties save over $600,000 each year by sharing various administrative positions without impacting services to individuals served. She has been the shared superintendent since 2011. Her leadership led to both counties receiving the Project Transformation Grant and participating in Ohio Department of Developmental Disabilities pilot programs such as the Waiver Pilot and the Remote Supports Pilot, both of which helped set the pace for county boards of DD across the state. For Zureich, the next chapter will bring exciting opportunities such as volunteer work and travel. 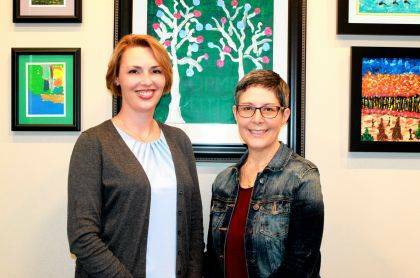 Wenning and Zureich will share the superintendent role Oct. 1 through Dec. 31, after which Wenning will assume the full role. An announcement regarding a farewell/welcome celebration for the two will be made at a later date. Submitted by the Champaign County Board of Developmental Disabilities.